Son of the sun, little lost shaman. Born in El Salvador, in the midst of a violent and treacherous struggle for power. He was there to learn. Born in the desert. The dust of desolation, the vast expanse of emptiness where there is no room for weakness, no room for government or rules, where the heat is never lacking and water is a precious commodity. The ground is rough and hard, a wide valley of rocks and sand. Here there are only the clans, scavengers looking for food and artifacts, to fulfill their secret purposes. In the early days there were two men with him, the old and the young. Young man is quick and can get food. Old man puts his hand on Bruto's shoulder and talks to the young, but Bruto doesn't listen. He came to the north to find a school. But before that could happen, there was more preparation for him to endure. One night, they're attacked by a wild clan from the northern lands. They slaughter both men and Bruto is left in a hole to die. In the north, he was taken in by the violent Hispanic gangs that infest East Palo Alto and Redwood City. 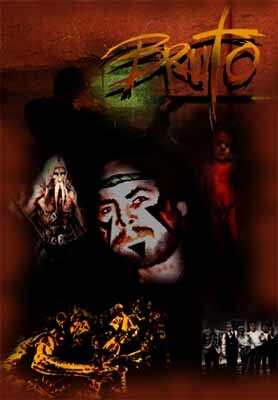 In the hole, Bruto talks to spirits, the spirits of dead animals, dark, moist, hot. They talk about his travelling, his voyage, they talk about waiting. "Everything must come to pass eventually." "We have to stick together if we are to survive." One night he is picked up, pulled up by the hair. The savage puts him on his shoulder and leaves the hole. Outside, there's a band, almost like the band that murdered his companions. Vests, yellow jackets, metal breast plates, strings of grenades and huge machine guns. "You were with us before, and when you died, we lost you." They don't sleep in the holes, because they say there are malignant beings in there, but they sleep around them, in a circle. Sometimes they find little kids inside and they pick them up, and so the band grows.If the kids are not good, they're rejected. But they don't sleep much. They eat bugs and reptiles. They are working constantly, cleaning equipment, hunting, making plans... always something to do, somewhere to protect and someone to fight. After finding J.C. again, he was gradually pulled into a new reality. He was close to finally meeting and recognizing Bruto. Eternally fighting for the flag. From dungeon to dungeon, castle to castle, cavern to cavern, explosions, screams, orders shouted out. "When you come back, you must find your place. If you're close to the base, you must defend. If you're not, then you must go and get the flag. Sometimes the flag makes this huge throbbing sound, which hits you in the heart and makes your whole body vibrate. It's a battle of Gods, we're just here for them.